February is strange month in Sydney – everybody is back at school and work after the summer holidays but it is a month that is often hotter and more humid than January. There’s a sense of lingering resentment amongst people, the holidays are over but it’s still too hot to fully adjust back to the routine of work and school. A few months ago, my son asked me if it was true that American school children had three months summer holiday. When I said that this was right, he was outraged, stunned by the injustice that American kids have almost three months off during the summer, when here in Australia we have to make do with a measly six weeks and are pushed back into a new school year in the heat of February. I’m sure it must have some effect on our national psyche having the beginning of the work and school year in the midst of our hottest time of year. You know you should be getting back into the swing of things, developing new projects, acting on new year resolutions, but it’s just too freaking hot to bother and all you can do is dream of the cool of autumn and for your life begin anew. 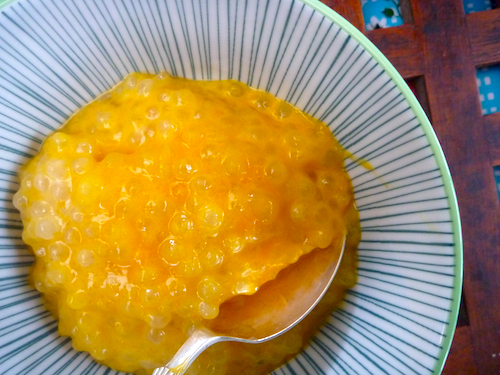 I could have just eaten my mango gift but I was in the mood for celebrating the bounty and climate of Sydney and what better way to embrace the heat and humidity than with a refreshing bowl of mango sago. 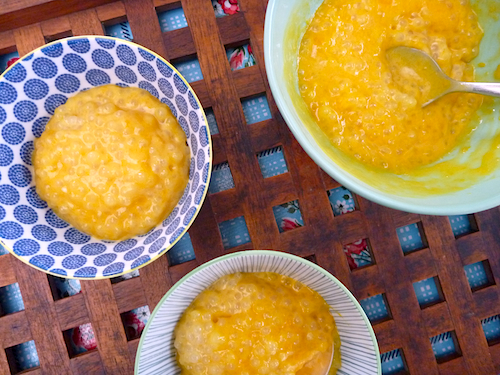 This sago recipe also comes from my sister and is a very simple, easy recipe that can be paired with almost any pureed fruit. My sister often makes it as a pink sago with watermelon, which is wonderfully light and refreshing but rock melon, honey dew and guava also work well. My mum used to make sago with milk and sugar when I was a kid, which we nick named ‘frog eyes’. The gluey pop of the sago along with the mucus-y, viscosity of the milk gave me a childish phobia about it, because it often felt like I was literally eating frogs eyes. The flavours in this coconut milk and fruit sago are so fresh and clean, it has completely dispelled my childhood distaste for this dessert. In the middle of February, this sago is just the thing to for renew flagging appetites and energy to go back and face the world of work and routine. 1 cup of pureed fruit – mango, watermelon, honey dew, rockmelon and guava are all good, just bung the fruit in your food processor and whiz until smooth. Bring water to boil add sago and simmer for 10–15 minutes until sago is completely translucent. Remove sago from heat, cover and let sago sit for another 5–10 minutes to complete the cooking. Stir through sugar until dissolved then mix through coconut cream, chill in the refrigerator for about an hour. About half an hour before serving, stir lime juice (if using) through through pureed fruit then mix fruit through sago, chill slightly just before serving. Lovely! I just enjoyed a mango and sago gelato the other night. I’ve not thought of pairing watermelon with sago but I like that idea a lot. Mango sago! Wow! I’m not a huge mango fan, but for some reason I have just never considered any other flavour of sago besides lemon and the classic milky one. This opens up a whole new world of possibilities. Thanks! I’ve never heard of Mango trees growing in Tassie, I’d be interested to hear if they bear fruit. That sounds lovely! I’ve never tried sago but have often wondered what it’s like, you’ve definitely given me the motivation to actually try it now! We have a lovely range of things that will grow here but unfortunately I’m not very good with plants, yet. I love sago particularly with the jaggery sugar sauce which I’ll post one day too. We never ate much mango growing up as my dad is allergic to it (I know, of all things to be allergic to!) so I’m trying to make up for lost time now by using mango wherever I can! 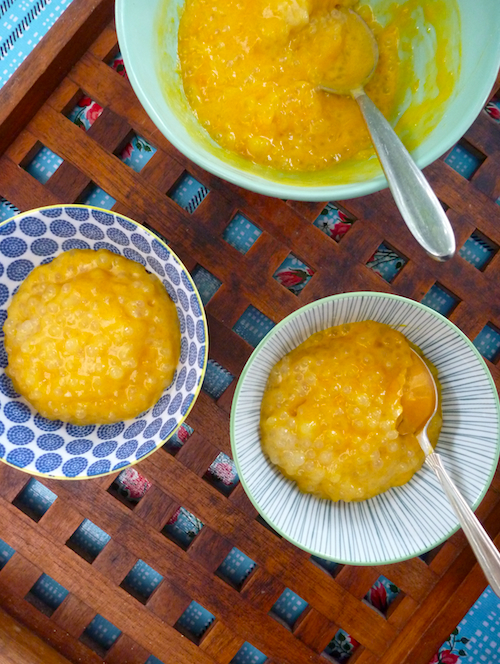 This looks like a perfect way to eat more mango to me! Mangos are the one thing that makes the extreme heat in summertime worthwhile.